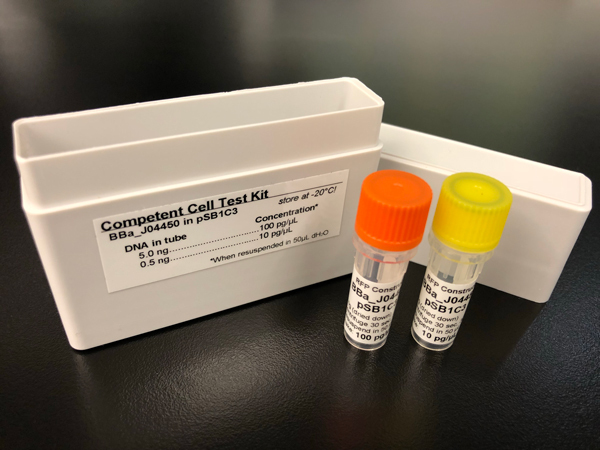 Before using your competent cells in an experiment, use the Competent Cell Test Kit to test the efficiency of your competent cells! The kit includes two vials of dried-down purified plasmid DNA from BBa_J04450 (RFP construct) in plasmid backbone pSB1C3. When resuspended with 50uL dH2O, the vials will result in different concentrations: 100 pg/µL, 10 pg/µL. Perform transformations with each of these to determine how efficient your competent cells are. It is important to have efficient competent cells because transformations performed with ligation products usually do not yield as many colonies due to the low DNA concentration in the ligation mixture. This means that you may see different results doing this test than you will at the end of the 3A Assembly protocol, or any other ligation. You can use the following suggested protocol for heat-shock transformation to test your chemically-competent E. coli cells. Clean your working area by wiping down with 70% ethanol. Thaw competent cells on ice. Label one 1.5 mL microcentrifuge tubes for each transformation and then pre-chill by placing the tubes on ice. Do triplicates (3 each) of each concentration if possible, so you can calculate an average colony yield. Spin down the DNA tubes from the Competent Cell Test Kit/Transformation Efficiency Kit to collect all of the DNA into the bottom of each tube prior to use. A quick spin of 20-30 seconds at 8,000-10,000 rpm will be sufficient. Note: You should resuspend the DNA in each tube with 50 µL dH2O. Pipet 1 µL of DNA into each microcentrifuge tube. Pipet 50 µL of competent cells into each tube. Flick the tube gently with your finger to mix. Pre-heat waterbath now to 42°C. Otherwise, hot water and an accurate thermometer works, too! Heat-shock the cells by placing into the waterbath for 45 seconds (no longer than 1 min). Be careful to keep the lids of the tubes above the water level, and keep the ice close by. Immediately transfer the tubes back to ice, and incubate on ice for 5 minutes. Add 950 µL of SOC media per tube, and incubate at 37°C for 1 hour shaking at 200-300rpm. 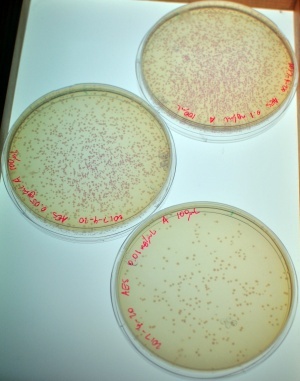 Prepare the agar plates during this time: label them, and add sterile glass beads if using beads to spread the mixture. Pipet 100 µL from each tube onto the appropriate plate, and spread the mixture evenly across the plate. Incubate at 37°C overnight or approximately 16 hours. Position the plates with the agar side at the top, and the lid at the bottom. Count the number of colonies on a light field or a dark background, such as a lab bench. Use the following equation to calculate your competent cell efficiency. If you've done triplicates of each sample, use the average cell colony count in the calculation. Competent cells should have an efficiency of 1.5x10^8 to 6x10^8 cfu/µg DNA, where "cfu" means "colony-forming unit" and is a measurement of cells. You can download Transformation Efficiency Calculation.xls for convenient calculation of the efficiencies.